Swedish art deco era drop front dry bar. 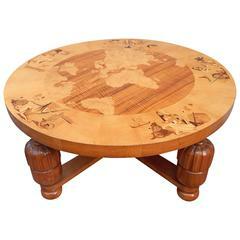 With intricate inlay depicting jazz age musicians and scenes. 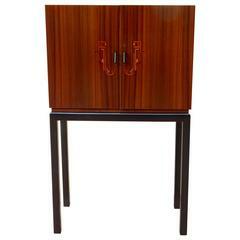 Designed by Birger Ekman for Reiners Mobler in Mjölby, Sweden in the 1930's. In great original condition in original finish. Some signs of previous use on inside. No instability. Original key. 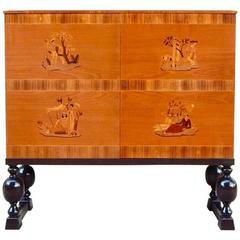 With two exterior drawers in Karelian birch. 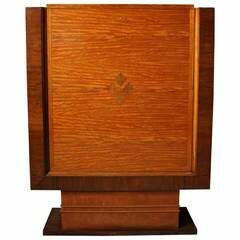 Case/inlay rendered in birch, mahogany, ebony, elm root and rosewood. 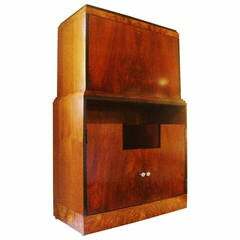 Fine Art Deco walnut and satinwood secretaire or bar by De Coene with two fall-down doors, the top one opening on a secretary /bar. Marquetry details on front. 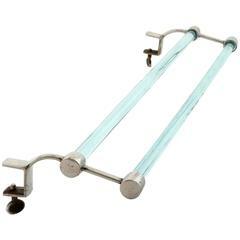 Graceful bar with revolving door in lacquered palisander and brass parts. Inside maple wood and it has four spaces for bottles and it is on brass wheels. France, circa 1938 from Paris. 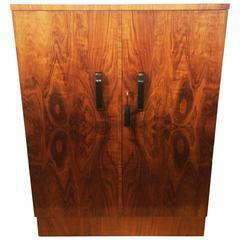 American Art Deco Skyscraper Drop-Front Veneer and Black Lacquer Bar/Secretaire.